Some North Pacific salmon have been declining since 1900 even though the total fishery (all species) seems to have increasing fishing catch and total increasing stocks. This decline (in some areas and by some species) is due to many things, most importantly overfishing, dams and pollution. It is thought that ten to sixteen million salmon spawned regularly in the Columbia River in the states of Oregon and Washington before white settlement began. This would have been about 120 to 160 million pounds of fish. In the 1990s there was estimated to be less than two million fish left and seventy percent of these were from hatcheries. There are at least eight dams that must be crossed for the adult salmon to return to their spawning grounds. The babies must go through each of the reservoirs behind the dams as well as the turbines in each dam so that they can get to the ocean. All of this takes more time and subjects them to many more predators. In the reservoir it is hard for both the adult and baby salmon to detect the current and find their way (the normal cue to their migration direction, the current, is disrupted for a time in the calm waters of the reservoir). It is not only Alaska, Oregon and Washington that have salmon populations ... Idaho and California have significant numbers as well. The Puget Sound salmon decline may be affecting the resident killer whales. It is thought that there has been a ninety percent decline over the last 100 years in the amount of salmon returning to the fresh water streams in the Puget Sound, Washington, area. This area has a unique group of killer whales that feed almost exclusively on fish. These resident killer whales have been experiencing drastic population problems since about 1995. See the lesson on killer whales for a detailed discussion of this group. Their decline may be related to a decrease in their primary food - salmon. Commercial salmon catch is primarily chum and pink salmon (about 60 to 80 percent) with sockeye making up another 10 to 20 percent and the last 10 percent a mix of coho and Chinook. Sport salmon catch is primarily coho and Chinook. 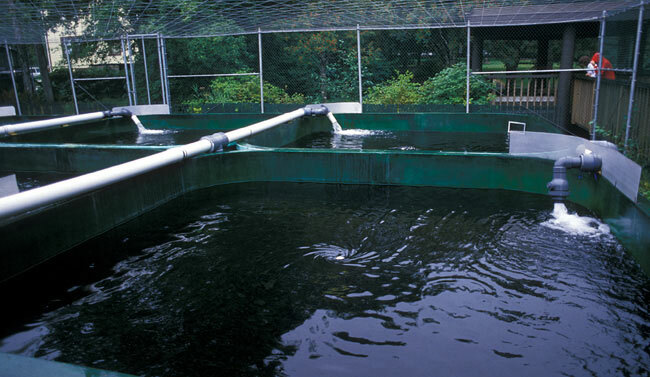 Artificial propagation of salmon began in the late 1800s. In nature only about five to ten percent of the natural eggs survive. It was discovered that, in a hatchery, under controlled conditions, up to ninety-five percent can survive. In 1872 Chinook salmon were cultured in the Sacramento River Basin in California. 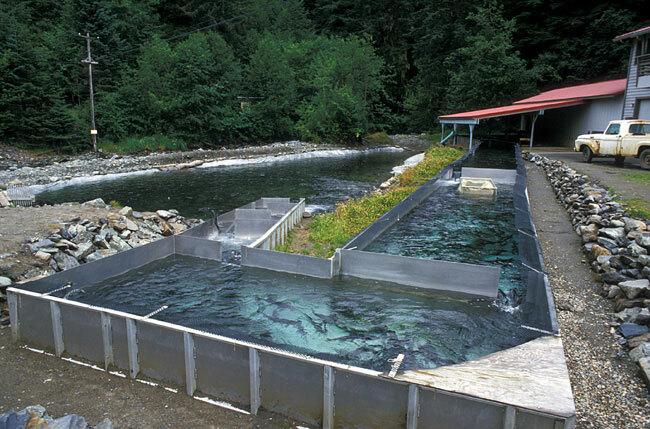 The Central Hatchery was one of the first to start a salmon stocking program in 1909. They began on the Columbia River in Oregon by rearing about 60 million salmon (mostly Chinook). Unfortunately not a lot was known about the natural history of the salmon when artificial propagation first began. The first hatcheries mixed salmon stocks from different streams and released their product randomly. This began problems with what some scientists think has led to a potential weakening of the survival ability of salmon. Since each stream has its own population and different populations rarely mix in reproduction, each population has its own unique and specific adaptations for that particular stream. When this is mixed with other genetic strains it may yield animals that are not as well adapted to their environment. It is quite rare for a salmon to stray from its natal stream to another stream and reproduce with another population. 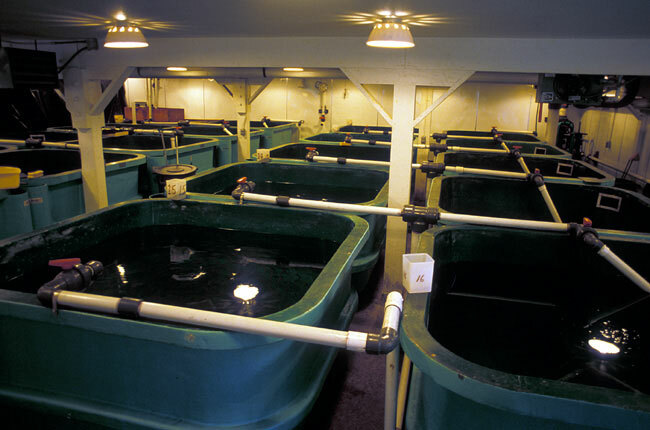 During the last 25 years hatcheries have become sensitive to separating each native population in their artificial propagation programs. This will result in more natural artificial propagation and hopefully, better survival. It is hoped that the mixing of genotypes in the early stages of hatchery development has not weakened each population. The Endangered Species Act, in the United States, protects certain Evolutionarily Significant Units (ESUs) of Chinook, coho, sockeye, and chum salmon (plus some steelhead). These ESUs are the distinct populations (in certain streams) whose numbers are in the most danger. Many times these are populations whose stream entrance has been cemented or turned into a pipe. So far none of the North Pacific salmon species (as a whole) are listed as endangered. Salmon are now maricultured all over the world. Chinook are maricultured in both the North Pacific and Chili. Chilean forms have escaped in the 21st century and started their own wild populations in Chilean rivers. In 1875 Chinook eggs were sent to New Zealand and in 1907 Chinook salmon were seen returning to New Zealand streams. They are now thriving there. Although salmon were introduced to the Great Lakes most of these are still artificially propagated. 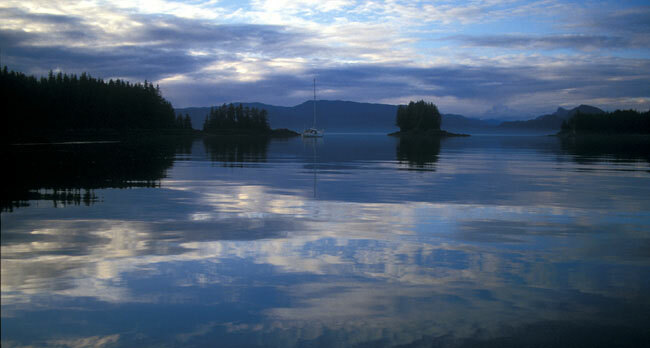 Alaska outlawed salmon farming in 1990. They wanted to protect their stocks from the problems that can result from mariculture - especially the mixing of the populations to produce weaker fish. It was also thought that with so much mariculture the competition for food in the ocean would increase and ultimately result in smaller numbers of fish. Humans continue in their interaction with salmon both catching them for food and protecting them with laws, hatcheries and environmental accommodations. 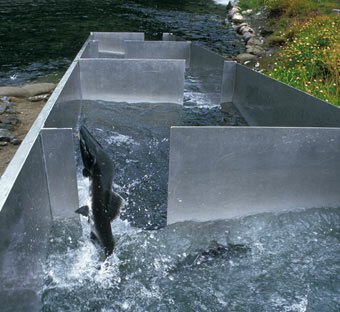 Now, if a dam is built across a salmon stream then fish ladders must be provided for the salmon so that they are not separated from their spawning grounds. This interesting species is still a big part of the marine environment even though it has been heavily preyed upon by man. Habitat loss, mostly associated with the condition of their native streams, continues to be a main threat to the North Pacific salmon.